With all the hubbub about NSA spying, Google’s PR people really want you to know how separate the company is from America's military-industrial complex. Earlier this week, Google made a big show of refusing DARPA funding for two robotics manufacturers it purchased, even though the companies themselves were financed with plenty of DoD cash. It's a nice gesture, and one that was welcomed by those who want Silicon Valley to be free of government interference. Unfortunately, while a crowd-pleasing announcement is good for Google's public image, it does nothing to change the company's long and ongoing history of working closely with US military and surveillance agencies. Last week, I detailed how Google does much more than simply provide us civvies with email and search apps. It sells its tech to enhance the surveillance operations of the biggest and most powerful intel agencies in the world: NSA, FBI, CIA, DEA and NGA — the whole murky alphabet soup. In some cases — like the company's dealings with the NSA and its sister agency, the NGA — Google deals with government agencies directly. But in recent years, Google has increasingly taken the role of subcontractor: selling its wares to military and intelligence agencies by partnering with established military contractors. It's a very deliberate strategy on Google's part, allowing it to more effectively sink its hooks into the nepotistic, old boy government networks of America's military-intelligence-industrial complex. Over the past decade, Google Federal (as the company's D.C. operation is called) has partnered up with old school establishment military contractors like Lockheed Martin, as well as smaller boutique outfits — including one closely connected to the CIA and former mercenary firm, Blackwater. This approach began around 2006. Around that time, Google Federal began beefing up its lobbying muscle and hiring sales reps with military/intelligence/contractor work experience — including at least one person, enterprise manager Jim Young, who used to work for the CIA. The company then began making the rounds, seeking out partnerships with established military contractors. The goal was to use their deep connections to the military-industrial complex to hard sell Google technology. When Director Michael Bradshaw came to Google Federal about four years ago, he visited all the big government contractors in the federal market, going door to door to promote partnerships. "A lot of people didn't even know Google Federal existed," Bradshaw said. "I think we were more of a novelty in their mind." Fast forward four years, and many traditional government contractors are clamoring to work with the company. Both sides sees advantages in the collaborations. Despite Google's widespread commercial success, the partnerships help the Internet giant establish a beachhead in another lucrative market. Who are some of these "traditional government contractors?" The Washington Post article mentioned Lockheed Martin. But there are plenty of others. Looking at the non-classified government contracting database, we can see Google partnering with Northrop Grumman Space and Mission Systems Corp and tag-teaming the DoD for a $1-million contract to install a "webs Google Earth plug-in." Northrop Grumman is one the top three of biggest arms manufacturers in the world. It designed the B-2 Stealth bomber, builds and outfits nuclear-powered submarines and nuclear-powered aircraft carriers. It is also intimately involved with all sorts of NSA surveillance operations, and was part of a team that designed Trailblazer — a multibillion-dollar mass Internet, e-mail and telephone surveillance system that was such a massive failure that it eventually had to scrapped. In 2008, Google paired up with Eyak, a boutique military contractor based in Alaska, for a $2.735m DoD contract to install Google Earth. Like all good military contractors, Eyak's execs were recently involved in $28 million bribery and kickback scheme. You can check out Google's other subcontracting gigs over at the Federal Procurement Data System — which range from just a few thousand dollars to multiple millions. But Google partners for classified military/intelligence contracts are, unsurprisingly, not so easy to pin down. From Google's previously classified 2003 work order for the NSA, we know that in some cases the company is forbidden to disclose information or even admit the existence of contracts without authorization from the US government. Still, Google's "Enterprise Government" page yields a few hints. On it, Google lists some of the companies it partners with to deliver products and services to the government. "Indeed, so many NSA officials have gone to work at SAIC that intelligence insiders call the company 'NSA West.' SAIC also does a significant amount of work for the Central Intelligence Agency, where it is among the top five contractors." Another, lesser-known contractor stands out as well: Blackbird Technologies, a secretive hi-tech military contractor with strong ties to the CIA and the infamous mercenary firm Blackwater. Wired's Noah Shachtman — one of the few journalists to write about the company — describes Blackbird as "Manhunt Inc" because the company's flagship product is a sophisticated locator bug that's used for the covert “tagging, tracking and locating” of suspected terrorists/persons of interest out in the field. These bugs don't just track someone's location, but surveil their cellular communication, their WiFi traffic and can apparently be used to extract intel wirelessly from devices. Virginia-based Blackbird Technologies, has become a leading supplier of equipment for the covert “tagging, tracking and locating” of suspected enemies. Every month, U.S. Special Operations Command spends millions of dollars on Blackbird gear. The U.S. Navy has a contract with Blackbird for $450 million worth of these so-called “TTL” devices. “Tens of thousands” of Blackbird’s devices have been sent to the field, according to a former employee. And TTL is just one part of the Herndon, Virginia firm’s multifaceted relationship with the special operations, intelligence and traditional military services. Panther permits isolated, missing, or threatened VIPs to send an encrypted distress signal and be tracked anywhere in the world. These handheld, battery-powered, personnel locating and emergency signaling units provide both cellular- and satellite-based communications paths and are designed for ease of use. 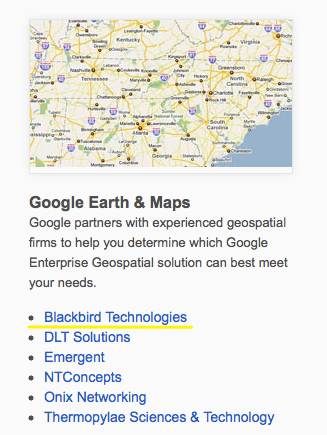 Much of Blackbird's tech involves geo-tracking, which makes the company a natural partner for Google's military-grade Google Earth software — developed as it was in close collaboration with the US military and intelligence community. But Blackbird is very likely involved in more than just passive observation. Several former Blackbird employees told Wired's Noah Shachtman that Blackbird routinely went “outside the wire.” Meaning the company put armed operatives into battle zones on special operations, including search and rescue missions to extract missing/captured soldiers. A military-surveillance tech contractor putting armed operatives in the field? Hmm... that would would seem to put the company in a totally different class of contractor — somewhere closer to the likes of mercenary security firm Blackwater/Xe/Academi. Now serving as Blackbird's vice president, Cofer Black is a high-level spook with a long and distinguished career. He served six foreign tours in the CIA clandestine service, mostly in Africa and the Middle East. Cofer was CIA station chief in Sudan in the 1990s, while Osama bin Laden had his base of operations there. He was was also the head of the CIA's Counterterrorist Center in the lead-up to Sept 11 attacks. After failing to stop the attackers, he was put in charge of hunting down Al-Qaida, and then became infamous as the architect of the CIA's "extraordinary rendition" program, which abducted and tortured terrorist suspects at top secret CIA run black sites. In 2005, Cofer parlayed his three decades of CIA work into a lucrative gig with Blackwater, overseeing intel gathering for governments and private sector clients. In 2007, a year before moving from Blackwater to Blackbird, Cofer got a cushy gig providing foreign intelligence assessments on the Middle East to Mitt Romney's failed 2008 presidential campaign. Blackbird is an insanely secretive company — and proud of it. What we do know is that the guys behind Blackbird don't just work to neutralize the "enemy" abroad. They have no qualms about using their military spook technology against American civvies: neutralizing the "enemy" at home on behalf of powerful corporate interests. And by enemy, I mean journalists, labor unions, political activists and whistleblowers. [In 2009], the founders of Blackbird set up a separate venture capital firm, Razor’s Edge Fund. By 2010, it had attracted 26 investors and $21 million dollars. One of the planned investments: a 20 percent stake in the security firm HBGary, before the company became infamous for its proposals to smear WikiLeaks and its supporters. HBGary did more than spy on WikiLeaks and its supporters. It was part of a group of companies — which included (Pando investor, via Founders Fund) Peter Thiel's military intel contractor Palantir — hired by the US Chamber of Commerce to run a surveillance, sabotage and smear campaign against reporters, labor unions, environmental activists and progressive political groups. Internal emails — obtained after Anonymous hacked the HBGary's server and released the company's internal correspondence — revealed that HBGary was compiling and circulating detailed dossiers on its "targets," including their photos and identities of their children and spouses. It's not surprising that Blackbird wanted to buy a chunk of HBGary. Until it was hacked and humiliated by Anonymous, HBGary was a promising intel company, doing work not for both private sector and military/intelligence clients. Among other things, it pitched to help build a DARPA system to detect insider threats to classified military and intelligence computer networks, allowing would-be leakers like Chelsea Manning and Edward Snowden to be identified and caught before they even made a move. As fate would have it, Blackbird was one of the contractors who submitted a bid on this contract as well. Google's leadership has publicly been very critical of government surveillance in the wake of Edward Snowden’s NSA leaks. Google chairman Eric Schmidt called it "outrageous" and registered a personal complaint with President Barack Obama. The company even helped launch a Silicon Valley organization ostensibly dedicated to promoting government surveillance reform. Of course, Google execs can gesture for the cameras all they want, and they can pretend to distance the company from the military-industrial complex. But Google's partnerships with military contractors like SAIC, Northrop Grumman and Blackbird is just more more evidence of how snugly the company is in bed with the US military-surveillance complex. SAIC and Northrop Grumman in particular have a long history of working with the NSA — designing, building and running the very same domestic surveillance programs that Google is supposedly against. With questionable partners like these, it's no surprise that Google had no qualms about peddling its services to a controversial police surveillance center in Oakland explicitly designed to spy on protesters and labor activists. Most other big tech companies — including Microsoft, Oracle, IBM and Amazon — are also deeply in bed with our military-surveillance state. What makes Google stand out is the sheer amount of data and information that the company has on the American people. It's important that we — the millions of people who trust our data to Google every day — understand what Google is: It isn't a traditional Internet service company. It's not even, as mild cynics are fond of saying, an advertising company. Google is a whole new type of beast: a global for-profit surveillance company with a mission to funnel as much of our daily life in the real and online world through its servers. The purpose: to track, analyze and profile us as deeply as possible — who we are, what we do, where we go, who we talk to, what we think about — and then constantly figure out ways to monetize that intelligence. Google is ubiquitous enough in civilian life, which makes it the last company you'd want getting in bed with corrupt private intelligence contractors and shady quasi-merc outfits like Blackbird. We asked Google, SAIC and Blackbird for comment on this piece (~2+ hours ago) but none had replied by press time. We will update this piece if we hear back.